Green tea and cinnamon both have value for their flavor and health-promoting properties. These foods provide antioxidants, vitamins and an assortment of other nutrients that may help prevent or treat certain conditions. Although green tea and cinnamon are generally considered safe for consumption, consult your health-care practitioner before taking them in supplement form. Camellia sinensis, commonly referred to as green tea, provides a variety of health benefits. This tea contains vitamin C and E, as well phytochemicals, including flavonoids, tannins, catechins and polyphenols. Phytochemicals are antioxidant substances found in plants that support health and help to prevent disease. Due to its potent antioxidant activity, green tea helps to prevent free radical-induced damage to your cells and DNA, and may even repair cellular damage that has already taken place. It also helps to destroy carcinogens, or cancer-causing substances, in your body. 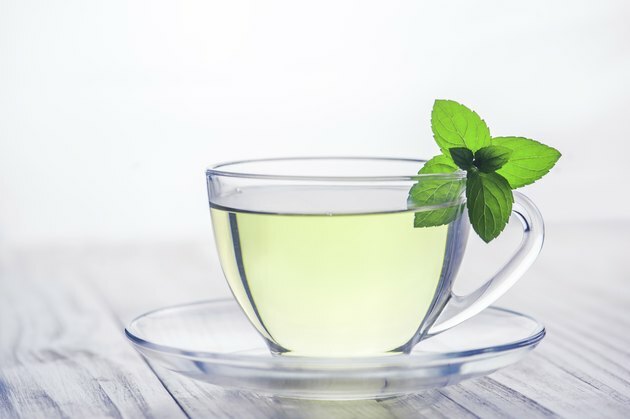 According to Memorial Sloan-Kettering Cancer Center, drinking green tea or taking a green tea extract supplement may help to prevent and treat heart disease. Research also suggests it can help lower elevated cholesterol levels, and prevent high blood pressure and hardening of the arteries. Green tea may also help prevent and treat cancer and gastrointestinal disorders, improve cognitive function, relieve diarrhea and prevent bacterial infections. In addition, green tea contains caffeine and catechins, two substances thought to produce a fat-burning effect and to help individuals obtain and maintain weight loss. MSKCC reports that studies have shown conflicting results from the use of green tea for all these purposes, however, and more research needs to be done to confirm its efficacy. Cinnamon, which comes from evergreen trees, is commonly added to foods and beverages. Similar to green tea, cinnamon has free radical-scavenging properties and contains numerous beneficial phytochemicals. According to Phyllis Balch in her book "Prescription for Nutritional Healing," cinnamon contains the minerals calcium, chromium, copper, iodine, iron, manganese, phosphorus, potassium and zinc, and the vitamins A, B-1, B-2, B-3 and C.
Cinnamon is helpful for stomach and digestive disorders and enhances digestion by increasing your body's ability to properly break down and absorb nutrients in food. Other purported benefits of cinnamon include fighting fungal infections, relieving nausea, treating diarrhea, increasing peripheral circulation, warming the body, reducing congestion and treating uterine hemorrhaging. It may also help lower cholesterol and triglyceride levels, promoting heart health. These uses are based largely on anecdotal and not scientific evidence, however. Cinnamon supplements are common in the treatment of Type 1 and Type 2 diabetes. Scientists believe that cinnamon helps to improve insulin sensitivity and regulate blood glucose levels, which are two primary complications in diabetics. According to Laura Shane-McWhorter in "The American Diabetes Association: Guide to Herbs and Nutritional Supplements," green tea is helpful for the prevention and treatment of diabetes as well. The exact mechanism of action is unknown, but its medicinal effect may come from the polyphenols and other ingredients found in tea that enhance insulin sensitivity.